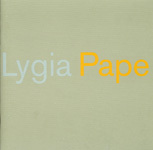 Lygia Pape is one of the founders of the Neoconcrete movement in Brazil in the 1950s. This was the first presentation of her pioneering abstract work to a US audience, and included the innovative cardboard book/sculpture/poem Book of Creation (1959) and the Neoconcrete Ballet (1959). The catalogue includes an essay on her work by Guy Brett. 2001. 24pp. 15 color and 5 b/w illustrations. ISBN 1-879128-24-1. De Barros was one of the first abstract photographers in Brazil. His fotoformas of 1946-52, presented in this exhibition, reconstruct urban elements into a constructive fantasy of geometrical forms. The catalogue includes an essay by Adon Peres. 2001. 24pp. 9 b/w illustrations. ISBN 1-879128-23-3. With the opposition in disarray, Hamilton Mourão has become Bolsonaro’s top opponent.